Product #21682 | SKU ER125-MP9-15-BN | 0.0 (no ratings yet) Thanks for your rating! The MP9-15 MusicPRO Electronic Earplugs from Etymotic Research offer professional-grade hearing protection for performers, music educators, front-of-house crews, concert security personnel, audiences and others. 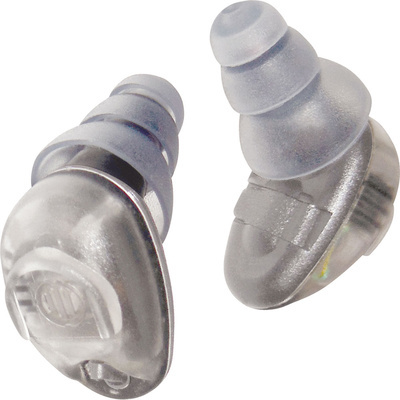 The earplugs provide either 9dB or 15dB of protection, and feature ready-fit eartips that can be worn without the need of having custom molds of your ears made. The MP•9-15 Music•PRO earplugs feature "Adaptive Noise Reduction" circuitry that automatically changes output levels as sound input levels change. When wearing these earplugs, hearing is experienced naturally as if nothing is in the ears, until sound exceeds safe levels. As sound levels increase, the earplugs gradually provide 9 or 15dB of sound reduction. Natural hearing is restored when sound returns to safe levels. The earplugs can also enhance soft sounds if desired. The earplugs come with seven pairs of ACCU•Fit eartips with different sizes and shapes, a flexible neck cord, filter tool and ACCU•Filters, cleaning tool, two #10 zinc-air hearing aid batteries, and a protective case.